It stands in a metal box, is controlled with a thermostat and makes a noise as it operates. This could be a heating and cooling system or just a cooling system alone. 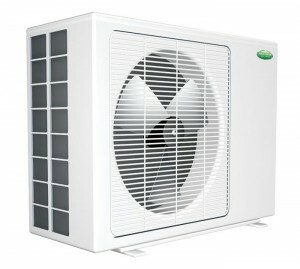 Although there are major differences between an air conditioning system and a heat pump, these are not always apparent. The first thing to realise is that an air conditioning system and a heat pump are in technological principle, the same. They just use this technology differently. An air conditioner works to move heat from inside a building to the outdoors. This air conditioning system works on the basis of a closed loop that contains a refrigerant. The cycle starts with the gaseous refrigerant. It moves through a valve in a compressor where it is subjected to pressure and heat and evaporates. The next step is a heat exchanger, also known as a condensing coil or condenser, where the refrigerant reverts to a liquid state. In the process it loses its latent heat into the air outside. This refrigerant then goes back indoors to another heat exchanger, in this case an evaporator or evaporating coil. The system contains a device that meters the flow of the liquid so that it moves at a low pressure. As the refrigerant evaporates, it absorbs the latent heat from the air indoors. This cool air is blown into the building through a series of fans and ducts. The liquid then moves back to the compressor and the cycle is repeated again. Heat pumps are integral components in an air conditioning system. They work on the same basis by transferring heat from one place to another through a refrigerant in a closed loop system. But this loop is designed in such a way that the pump is able to both extract heat from an internal area and move it outdoors during the summer, while in winter, it switches the direction of refrigerant flow to extract the latent heat from outside and moves it indoors to heat internal spaces. Heat pumps are designed to extract even the tiniest amount of heat from very cold conditions outdoors. They are able to heat a room using outdoor latent heat when temperatures outside are as low as -20 degrees Celsius. So unlike air conditioning systems that only work in one mode, a heat pump works in two modes: as an air conditioner and as a heater. A further difference between the two systems is that heat pumps do not always have to rely on an internal duct system to distribute hot or cold air. Ductless mini split heat pump systems consist of multiple indoor units that can fit into an individual room or space indoor. These are connected by the conduit for the refrigerant flow, suction and power cable but there are no ducts for distributing the air. The advantage of the ductless system is that it can be flexible. It can be installed as a free standing system or on walls and ceilings. It can also be mounted with a cover making it more attractive to look at than an outdoor box on a window ledge.